Use a combination of adults and students as greeters at the doors and throughout your student ministry area. Make sure you train them and have a schedule so each person knows the where, when, and why of their role. 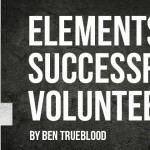 Make sure the new kid meets some of your adult volunteers. Each student needs a relationship with a Godly, caring adult. The new kid may not act super excited about this right away, but it is something they will think about as they process their experience later. Have core students from your ministry “on call” to help connect the new kid to other students. 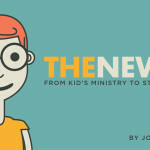 Ideally, you would have students from each grade that you know you can count on to follow through with the new kid throughout their experience at church. This takes a lot of training on your part (or the part of another adult) to help the students understand what to do and the importance of their role being more than introducing someone around. You want these core students to see this as an evangelistic/discipling action. Preach the gospel. When the new kid leaves you want them to have had the opportunity to connect with Jesus. Ultimately, this is a spiritual matter, and as such, it is out of your hands, but if God’s Word isn’t preached, taught, or discussed then how will the new kid experience Jesus? You can have the friendliest ministry in the world but if the new kid doesn’t have the opportunity to engage in God’s word then it is all worthless. Implement a strategic follow-up process. Never let one visit be the end of the relationship with the new kid. Make a follow-up phone call to the student yourself as the ministry leader. This is a good opportunity for you to meet the student’s parents, which is a key component in truly connecting a student to your ministry. Pass the contact information for the new kid on to one of your small group leaders and have them follow up as well. Remember the core student that helped connect the new kid from step three? Have them send a text or give a call as a third step. If the new kid visits your student ministry through an event or worship service, make sure you connect them to the small group environment of your church. When the new kid gets plugged into this aspect of your ministry it will do more than anything else to help them truly connect. Each event and worship service that you do should have a strategic connection to getting students plugged into small groups. Over the course of a year there are many new kids who walk in and out of the doors of student ministries across the country. The goal for these new kids is so much more than helping them to feel welcomed. It’s to introduce them to Jesus and help them to connect with the body of Christ where they can be encouraged, challenged, and equipped to live the life of a disciple. Next time the new kid walks in the doors of your ministry, make sure your ministry is more than just friendly.